Sugar is one of the worst possible things for your teeth. It interacts with the bacteria in your mouth, leading to plaque and tartar, which in turn lead to cavities. Plus, lots of things with sugar in them can also stain your teeth and lead to dry mouth. The bottom line: The less sugar you consume, the better your oral health will be. 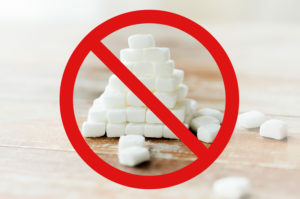 But how can you cut back on sugar without taking all the yummy goodness out of your diet? Here are a few creative tips from your dentist in North Dallas. Everyone loves to sink their teeth into a tasty cookie or mouth-watering pastry once in a while, but these goodies are packed full of sugar. An alternative is to bake your own treats at home. You can use less sugar than the recipe calls for. Another idea is to use unsweetened applesauce instead of sugar. Just replace sugar with a 1:1 ratio and cut back on another liquid in the recipe (for example, you may have to use ¼ cup less milk or water). Applesauce not only reduces the amount of the sweet stuff you consume, but it comes with bonus nutrients as well, such as fiber and vitamin C.
If you’re not one of those rare folks who can drink their coffee black, you might add a bunch of sugar to make it palatable. Instead, why not try some heavy cream? Heavy cream has practically no sugar, and you only need a splash of it to make your coffee nice and rich. Of course, it’s important not to go overboard with the cream; it contains a lot of fat and calories. There is quite a bit of debate around sugar substitutes like Splenda and stevia, but they are better for your teeth than regular sugar. If you choose to consume them, it’s best to do so in moderation. You may also want to do some research on the various sugar substitutes so you can find one that works well with your body. Many people gravitate toward Stevia because it is a natural sweetener that tastes good and doesn’t have any proven harmful side effects. Xylitol, another sugar substitute, is often used in chewing gum and may even be good for your teeth. Do you want a healthy smile that lasts a lifetime? Use these tips to cut back on sugar so your teeth can continue to look and feel great. Dr. Dale Greer has been practicing dentistry for over 30 years. He provides a range of services to protect and restore teeth. If sugar or other lifestyle factors are putting a damper on your smile, please don’t hesitate to reach out to our office at 972-233-4546.